Alfa Romeo is once again trying to establish itself in the United States market, and we wouldn’t blame you if you’re at least intrigued by the brand’s offerings. Of course, before you decide to pursue one of their vehicles, it’s a clever idea to get a general understanding of the company’s history. It can reasonably be “said” (there’s a pun there that you’ll soon understand) that Alfa Romeo has seen its fair share of changes over the past century. The company started way back in the early 1900s with a brand that holds little relevance today. 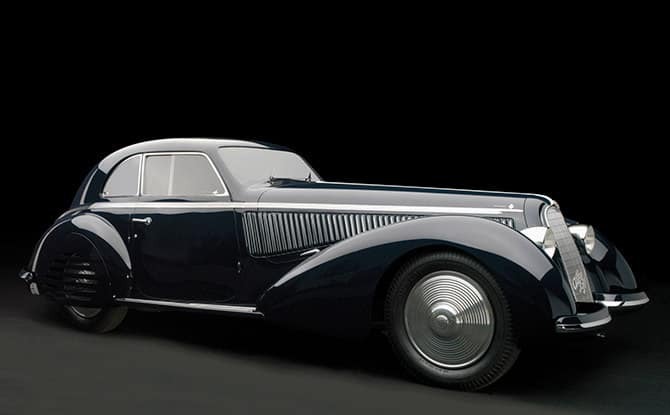 The Societa Anonima Italiana Darracq (otherwise known as “SAID”) was founded in Naples in 1906 by the automobile firm of Alexandre Darracq (along with several Italian investors). When Darracq determined that the mountainous area wouldn’t be suitable for a factory, he decided to move operations to Portello, which was a small suburb of Milan. By 1909, a 8,000-square-yard plant had been built, although sales were moving slower than expected. At this time, one of “SAID’s” chairman (and original investor) Ugo Stella decided to develop a new company in partnership with Darracq’s: Anonima Lombarda Fabbrica Automobili (or, as you’ve surely noticed, “ALFA”). This company’s first product was the 1910 24 HOP, which was designed by Guiseppe Merosi to help appeal to the Italian market. The engineer would soon design many of ALFA’s cars, including a 40 HP and 60 HP, a pair of 24 HPs designed for motor racing, and the Grand Prix-inspired GP1914, which featured a four-cylinder engine, double overhead camshafts, four valves per cylinder, and a twin ignition. These were some rather innovative inclusions for an early-1900s vehicle. Predictably, the First World War interrupted ALFA’s production of automobiles for about three years. However, in late 1915, the company once again reinvented itself. Neapolitan money-man Nicola Romeo took over the company, revamping his newly-acquired factories to have them cater to the production of military hardware. Using their car engines as a basis, the company produced new munitions, aircraft engines, compressors, and generators to help aid the Italian and Allied forces. Once the war ended, Romeo used his war profits to purchase locomotive/railway plants in Saronno, Rome, and Naples, which were all listed under the ALFA flag. The company initially resisted car production, but there were still more than one hundred nearly-completed vehicles sitting in their car factory. That was when Romeo decided to pounce on an opportunity. In 1920, the Torpedo 20-30 HP was released following the introduction of the Alfa Romeo brand, which combined the owner’s name with the decade-old company name. Merosi stuck around for the revamp of the brand, helping to design a number of consumer vehicles and race cars. The company gained further popularity in 1920, when Giuseppe Campari and Enzo Ferrari had major success racing the Alfa Romeo’s vehicles. Merosi would leave less than three years later, but the company got quite the haul when they convinced Fiat’s Vittorio Jano to become Alfa Romeo’s new chief designer (ironically, this would be the first of Fiat’s many positive contributions to the Alfa Romeo brand). Jano was mostly lured to the position thanks to Ferrari, who spoke highly of the Alfa race cars. The designer would soon design the P2 Grand Prix, which went on to win the first world championship for Grand Prix cars in 1925. Of course, the designer also contributed to the mechanical redesign of the company’s road cars. Using that P2 Grand Prix as inspiration, Jano engineered a number of small or medium-displacement four-, six-, and eight-cylinder engines. These engines were a bit ahead of their time, as they were designed to be both powerful and efficient (two attributes that were rarely seen in tandem). By opting to use a lighter alloy, hemispherical combustion chambers, centrally located plugs, and a number of overhead valves, Jano managed to produce a unique, one-of-a-kind engine. Both Romeo and Ferrari would soon leave the company, leaving Alfa Romeo in a bit of disarray. Fortunately, the Italian government stepped in to take control of the brand. Of course, as a result, Mussolini used the company’s vehicles as an unofficial symbol or emblem for his country. Given the affluence of the leader, the brand started producing higher-class, luxury vehicles. Alfa’s major factory was bombed during the Second World War, and the company had difficulties turning a profit. Customers seemingly couldn’t afford the pricier luxury cars, forcing Alfa Romeo to mass-produce vehicles that appealed to a number of different consumers. The major new offerings included the Guilietta line of coupes and two-seaters, which were accompanied by a selection of the iconic Alfa Romeo overhead Twin Cam engines. Motor sports picked up following the conclusion of the Second World War, and Alfa Romeo once again became the premier brand when it came to race cars. By the early 1950s, the brand was also experimenting with front-wheel drive compact cars, and their Bertone-designed coupe (featuring a twin-plug engine) soon became a hit. More financial issues hit during the 1970s, forcing Alfa Romeo to team up with Fiat in an attempt to keep the company afloat. Ford briefly tried to pursue a joint venture with Alfa, but Fiat eventually submitted a bid that was too good to refuse. Fiat played a big role in Alfa Romeo remerging in the luxury segment, helping to produce the GTA 147 hatchback, the Giugiaro-inspired Brera, and the high-performance 8C Competizione. When Maserati was re-purchased by Fiat in the mid-2000s, the brand was well on its way to becoming one of the premiere producers of sports and luxury vehicles. There’s no denying how resilient the brand has been, so drivers can anticipate that engineers are putting all of their blood, sweat, and tears into their products. Therefore, the company’s history indicates that Alfa Romeo’s vehicles are actually a perfectly logical target.